Deciding what to eat can be a challenge, but it doesn’t have to be. Pizza makes an excellent choice no matter what the weather or the occasion may be. It can be challenging to figure out what to eat day after day, but whether you’re dining alone or you’re feeding a group, pizza remains a tasty staple of the American diet. With so many flavors and styles to choose from, it makes a great meal for any occasion, no matter what time of year it is. While you’re enjoying the crisp days of early spring or autumn is starting to kick in, ordering a Fremont street pizza in Las Vegas is sure to be a hit. From the steaming cheese to the delicious crust, this is a meal that will warm you from the inside out. You can plan an all-out party or just have a few friends over for pizza in Sin City, even choosing a theme such as “Hawaiian” and ordering toppings that go with it. If it’s just you and the dog, you can curl up with a blanket for a movie marathon and easy takeout with your favorite pie. Summer is a time for pool parties, vacations and lazy days, so what better way to enjoy the Vegas heat than with an easy summer meal like pizza? You can order a dozen different kinds and have an all-nighter or let everyone in the family pick a new topping. One of the best things about Las Vegas pizza in the summer is having it cold for breakfast the next day. 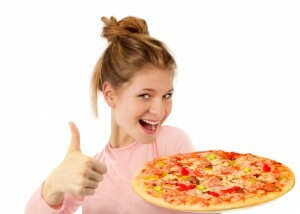 Whether the days are unbearably hot or you’re shivering from the winter blues, pizza is a great choice for any meal. It’s versatile enough to work for anything from a family dinner to a holiday party. You can dress it up by serving it hors d’oeuvre style or make it game-night friendly with open boxes on your counter. Regardless of the event, you’ll find it’s a great time for pizza.